The Spanish Safari Kitchen: Where Everyone Kisses the Cook! The heart of a home is usually the kitchen. Not only is it the place where meals are made, but it is also the area were families gather to share their lives. Arturo's home is no different, and much of the family life (and the learning!) take place in this environment. As a team, we wanted to create a warm and fun setting for Arturo's family. We wanted a space that would be inviting for the users and a space that would be conducive for learning. Angie, one of our very talented graphic designers, sketched out the initial idea. Angie Based her design upon the description of the kitchen in the lessons. She also included items to represent the vocabulary that will be used in the Spanish Safari lessons and added a few ideas of her own. The initial design above is what Vincent, our 3D modeler, based his work off of. Vincent modeled each item inside of the kitchen, using a program called Autodesk 3Ds Max. Once the 3D items were ready, Andrea (Our Lead Graphic Designer) and Daniel (Our Lead Developer) set the environment in Unity. The Learn Safari Kitchen. Models Without Textures. Once everything (3D models and textures) were set in Unity, the team had to go through and "optimize" the space, meaning they had to make it functional, while not having a high poly count (the number of polygons that can be found in a 3D model) which can hinder performance. The goal was to make models that look fantastic, but that won't slow down the speed at which a game loads. Vincent was even able to make some of the cabinets and doors open and close, therefore creating a truly interactive environment! The Spanish Safari Kitchen with a model of Arturo in it. Arturo and his family spend a great deal of time in the kitchen, therefore, the user will also spend a lot of time here. 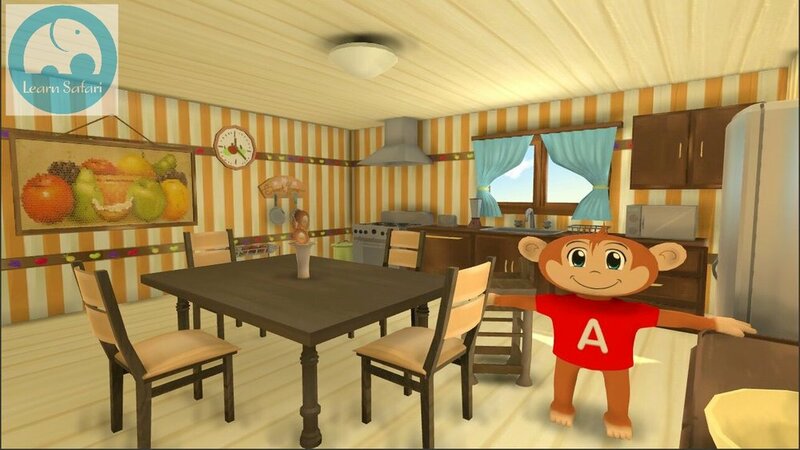 It is a great environment for learning vocabulary, and the user helps Arturo and his family make food, set the table, and even clean up. One thing that's important to remember, whenever you walk in, you always have to kiss the cook! (Especially if it's Mamá).